There are three fundamental sources of allergies in dogs: pests, the environment, and food. While pests like fleas and ticks can bring about allergic dermatitis, pollen and dust from the surroundings can lead to environmental allergies, food-borne allergies are special since there are a lot of things we can do to help minimize, if not eliminate, the clinical manifestations of food allergy in dogs. For starters, determining the triggering food allergen is crucial to providing safer and healthier nutrition for our pooches. And this is where our list of the best dog food for allergies comes in. One of the most important steps to addressing food allergies in dogs is identifying the protein trigger. Thankfully, using the hypoallergenic dog food from Wellness Natural can help simplify the process. 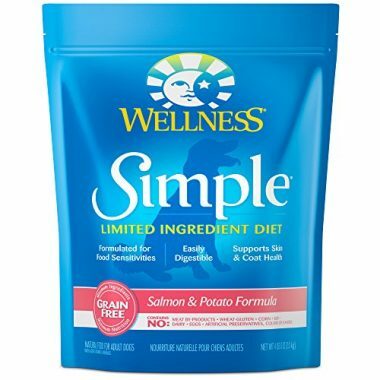 The Simple Limited Ingredient Diet Dry Dog Food is available in single animal protein sources as its primary ingredient to help narrow down the identification of food allergens. 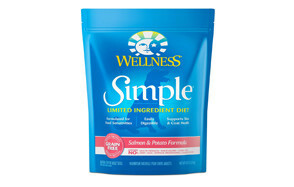 More importantly, the Wellness Simple comes with highly novel proteins such as salmon, duck, lamb, and turkey. While these are still highly proteinaceous foods, they are less likely to cause any allergies because these are not your usual ingredients that dogs have been sensitized with. Moreover, each formulation of the Wellness Simple is guaranteed never to contain cereal grains as well as other ingredients that may have allergenic potential. Add to these about 20 million CFUs of beneficial bacteria and you’ve got a really great product for dog food allergies. There are instances when your pooch doesn’t want to eat because of its allergies. While more expensive, giving it a wet dog food can help provide the nutrition it needs because it’s more palatable than dry kibbles. 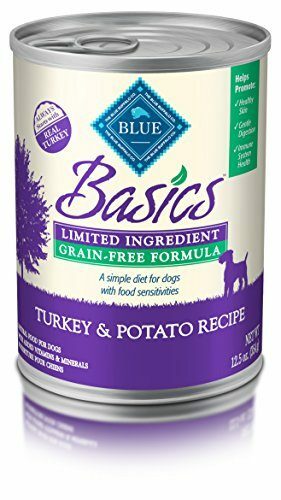 When it comes to the best hypoallergenic dog food in wet or canned form, you can always trust Blue Buffalo’s Basics Limited Ingredient Grain Free Formula available in duck, lamb, salmon, and turkey variants. Each formulation of this dog food for sensitive skin is made without cereal grains and using only single novel proteins as its principal ingredient. Of course, there are other ingredients, but owing to the fact that a great proportion of its volume is taken up by the principal ingredient, then it can be considered as a great hypoallergenic dog food. Also adding to its hypoallergenicity is its lower protein content than dry kibbles at only 7% per can compared to around 20 to 35 percent in dry kibbles. 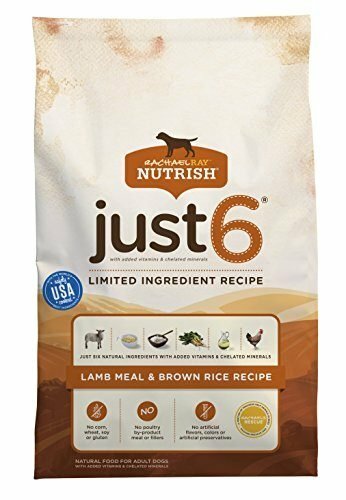 The Rachael Ray Nutrish brand of hypoallergenic diet for dogs consists of only 6 ingredients with lamb meal as its principal component. Adding nutrition to the lamb meal are a blend of brown and ground rice, chicken meal and fat, and beet pulp. Together they form Nutrish’s Just 6 Limited Ingredient Recipe Natural Dry Dog Food, making it a great alternative to other dog food for dogs with skin allergies. 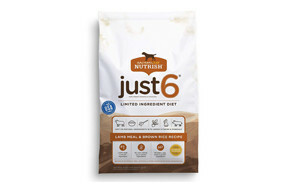 Do take note that the use of lamb as its principal component is what naturally makes the Nutrish Just 6 exceptional as a dog food for sensitive skin in dogs, owing to the observation that dogs have not developed full sensitivities to lamb protein yet. Besides, you’ve got the backing of a TV personality and celebrity behind this product for your pooch. Blue Buffalo has always been known for its fascinating array of breed-specific and purpose-driven pet food products. Take for example their High Protein Grain Free Adult Dry Dog Food particularly their salmon variant. This is one of the best hypoallergenic dog food because of its use of a novel marine protein – the salmon. This gives it one of the most ideal ratios of omega-6 and omega-3 essential fatty acids at 2.5:1. This helps improve the functioning of the immune system which can help in the better management of allergic reactivity. It’s also fortified with probiotics to further enhance the functioning of the immune system while improving digestive functions. 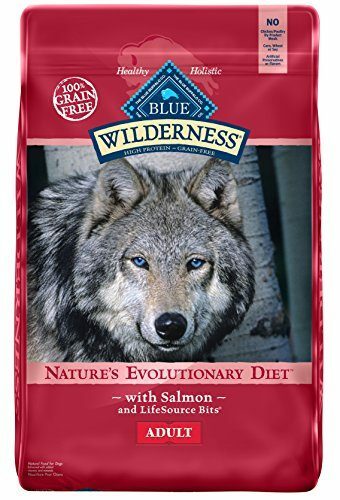 The BLUE Wilderness makes for a great meal for pooches with dog food allergies since it closely mimics what canines in the wild naturally feed on. 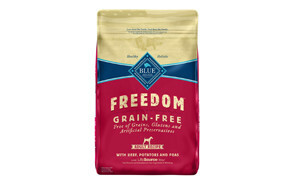 Blue Buffalo wants your dog to be free from the symptoms of dog food allergies. 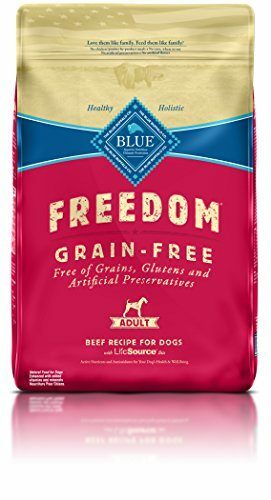 That is why it has formulated its BLUE Freedom Grain Free Dry Dog Food that comes with one of the lowest protein contents for a dry kibble. The BLUE Freedom is available in various flavors such as beef, chicken, and lamb. However, to really benefit from its hypoallergenic dog food potential, you simply have to choose the lamb version as it provides a safer profile than beef and chicken. While it is true that chicken meal has been added into the BLUE Freedom Lamb Recipe, this constitutes a very minor portion of this hypoallergenic diet for dogs. Its principal component is still deboned lamb with the secondary ingredient being turkey meal. Together, both lamb and turkey are known to have lower allergenic potential than chicken or beef. What’s more, BLUE Freedom comes with the ideal ratio of essential fatty acids at 1:4 as well as the inclusion of 6 different strains of probiotics, giving your pooch the means to improve its digestive functions and boost its immune system. It’s not really easy picking up a product that fits the special hypoallergenic food needs of your pet dog. Before going on a quest for the best dog food for allergies, you’d have to have a clear understanding of what food allergy in dogs really is, the most common manifestations, and the breeds of dogs that are susceptible to its formation. Equally important is knowing how you can assist your allergic pooch. In this section of this post, we’ll address all of these to empower you in making the correct decision as to the best dog food for your canine friend afflicted with food allergy. Food allergies are one of the most common complaints among dogs. These are manifested through a variety of symptoms that are not only confined to the gastrointestinal tract but also manifested through the skin and sometimes even in the respiratory and vascular systems. But why is it that dogs have food allergies? Before we take a look at the most common food allergies in dogs, it is important that we spend some time understanding what occurs in a typical food allergy. Food allergy is best described as the result of an over-reacting immune system. What happens is that immune system cells recognize a protein as something that is foreign and as such should be eliminated from the dog’s body. Proteins, in this sense, come from food. You’d be amazed to learn that protein is not only found in animals but also in plants. The bottom line is that the immune system is over-reacting to the presence of any protein in the food, be it from an animal or from a plant. Another important thing that you need to understand is that a dog that is allergic to one kind of protein is typically hypersensitive to other types of proteins. Additionally, if you’re going to look at the above food items, the top 5 ingredients are what many commercially available dog foods are made of. Now, let’s take a look at the journey of proteins in a dog’s body. When food is consumed, carbohydrates are first broken down into its secondary components in the dog’s mouth. Proteins and fats do not undergo initial digestion in the mouth. Instead, they undergo the initial stages of digestion in the stomach. Here, proteins are broken down into peptides. Once they are digested into peptides, they are pushed towards the small intestines where the peptides are further broken down into amino acids. Only when these have been turned into amino acids can the different cells in the small intestines begin to absorb them and move them towards the blood for distribution to the rest of the body. The classic journey is from proteins to peptides to amino acids before they can be absorbed. In a hypersensitive dog, the digestive tract is unable to digest some if not all of the proteins. This means they are not broken down into peptides and amino acids. As such, the cells of the immune system, 70% of which actually reside in the gastrointestinal tract, recognize these large protein molecules as ‘abnormal’. Hence, it mounts an inflammatory response we now know as food allergy. As such, food allergies occur if and only if whole protein molecules are not digested properly and are absorbed through the gastrointestinal tract as whole proteins. Technically, the absorption of whole proteins can be prevented by two distinct mechanisms that are embedded into the mucosal barrier of the gut. Its structural component helps prevent the physical absorption of the large protein molecules while the immune system component acts as a sensor which effectively recognizes the presence of harmful contents in the gut. As we have already learned, at this stage in the digestive tract, the proteins should already be amino acids. These are what a normal molecule in the gut should be like. As such, if protein is present instead of amino acids, then the immune system will react. Just how does this work? Well, inside the intestines are immune system cells known as Immunoglobulin-A or IgA. Some IgA are free-floating while others attach to the lining of the gut. When peptides are moved from the stomach and into the small intestines, these are allowed to pass through the protective gates of IgAs. When peptides are further broken down into amino acids, they are also allowed to pass through and absorbed. The reason for this is quite simple. Peptides and amino acids are small molecules that it is quite difficult for the IgA to catch all at once. On the other hand, whole protein molecules are so large that IgA will not have any problems catching them. But it doesn’t end there, unfortunately. Normally, the immune system is prevented from acting on these whole protein molecules by the gut-associated lymphoid tissue, better known as GALT. Sadly, food allergy occurs because of the failure of the GALT system in suppressing the immune response in the presence of whole proteins. Exactly why this occurs is still a mystery. This initiates a sequence of reactions that end with the formation of an allergic response. This is also called as hypersensitivity reaction. Here’s one sad fact about hypersensitivity reactions: the more your dog is exposed to the allergenic protein, the greater is the allergic response with each exposure. Every time your dog gest exposed to the allergenic protein, mast cells release histamine, a proinflammatory substance that produces many of the clinical manifestations we now associate with food allergies in dogs. We now know that the many symptoms associated with food allergies in dogs are directly related to the release of histamine and other pro-inflammatory substances by the mast cells of the immune system. It is quite fascinating to note that all of these started with a malfunction in the ability of the gut to break down proteins and the resulting over-reaction of the immune system to the presence of these proteins. Here are some of the symptoms and signs of food allergies in dogs. What Types of Dogs are Hypoallergenic? Experts believe that food allergy has a genetic component that somehow affects the ability of the dog’s immune system not to over-react to the presence of whole protein molecules. Also, scientists are trying to figure out the exact mechanism as to why the GALT system is not functioning in the presence of food allergy. It is because of this possible genetic connection of food allergies that some dogs are more prone to the development of such conditions than other pooches. While we don’t have a complete list of the types of dogs that can be considered as hypoallergenic or less prone to the development of food allergies, the following breeds are generally known to be highly susceptible to food allergy. If the breed of your pooch is not on this list, then it should be safe to say that it is less prone to the development of food allergies. Unfortunately, having a mixed breed of canine can pose some problems as any one of the breeds listed above can provide its food allergy genetic material into the mix. Also, there really is no guaranteeing that the dog you have doesn’t have any allergies at all. How Can I Help My Dog with Allergies? Hope is not lost for those pooches with food allergies. There are certain things you can do to help. Here are some of them. Your veterinarian can help you determine whether the symptoms you are noting from your dog are indeed the result of food allergy and not merely food intolerance. Many pet owners mistake some of the symptoms that we have listed above to be the result of food allergy. Your vet can help evaluate your dog’s health history as well as nutritional profile to determine whether the clinical manifestations are indicative of food allergy. More importantly, your vet can help you decide on what you need to do next. If you have been giving your pooch multiple protein and carb sources, now is the time to stop these altogether and proceed on feeding it with a novel protein and carb. For example, if your dog has been fed dry kibbles that contain chicken, beef, corn, and wheat in the past, you may want to discontinue this type of food and go for something new. You can try venison and sweet potatoes, for example. Stopping the current diet will help put a stop to the clinical manifestations and make your pooch more comfortable. Introducing novel proteins and carbs will help provide for their nutrient requirements. Once your pet dog has adjusted to the new diet and there are now no symptoms or signs of food allergies, then you can start reintroducing those ingredients of its previous food one at a time. For instance, you can start reintroducing chicken into its meal. You have to wait for a couple of weeks to see if there will be an immune response or not. If after 10 weeks your pooch remained relatively well, you can reintroduce another ingredient from your dog’s old recipe. You will have to do this one ingredient at a time. If, at any point in the elimination diet you are able to trigger an immune reaction from your dog, do take note of the ingredient that you recently reintroduced. This is one of your pooch’s allergy triggers. This way you now have an idea of what food you need to avoid giving to your pooch. Your veterinarian may actually recommend giving your pet a hypoallergenic diet. This type of specialty diet provides proteins in their already-broken down forms, meaning they are already peptides and amino acids. Knowing that these smaller protein products do not elicit an allergic reaction, then it should be safe (remember the IgA gates). Novel proteins are primarily used as an integral part of the elimination diet. However, this is not the only use of such proteins. You have to recall the pathophysiology of food allergies whereby the canine gut is unable to digest whole proteins and turn them into peptides and amino acids. Since the problem is inherently in the gut and the immune system itself, there really is a chance that even novel proteins will someday prove to be allergenic as well. It only needs time for the continuous exposure of the dog’s immune system to this kind of protein for it to develop hypersensitivity reaction. This is actually what happened with lamb and rice recipes for dogs. In the not-so-distant past, these food ingredients were highly valued because of their hypoallergenic potential. They were largely considered to be very novel proteins and as such will be least likely to cause allergies. Unfortunately, many pet food manufacturers have already included lamb as one of their mainstay variants that experts now are seeing a lot of dogs developing hypersensitivity reactions to such proteins and carbs. So, if you really want to give your pooch a novel protein, go for those that are truly novel. Great examples include kangaroo, crocodile or alligator, yak, bison, deer, or any other source of protein that is completely new and has not yet been formulated by pet food manufacturers. Just like giving novel proteins to our dogs with allergies, it is important to choose exclusive proteins. These are products that contain single protein sources. Consider a dog food that contains chicken, lamb, beef, salmon, and turkey and it so happens that it developed food allergy. Will you be able to pinpoint which among these animal proteins is the trigger for your dog’s allergies? Giving your pooch single protein dog foods is better when it comes to helping it overcome its food allergies. Choosing the right doggie chow for a pooch with food allergies can be challenging if you don’t understand the mechanism behind the development of such conditions. Sadly, many dog food manufacturers also fail to understand the unique pathophysiology of food allergy such that they continue to produce doggie food products that have highly allergenic potential. As much as possible, such food products must be avoided. Instead, you need to focus more on looking at doggie chows that are least likely to produce an allergic response from your pooch. Here’s how you can choose. Since the principal trigger of an allergic reaction is protein, your focus should be in the determination of the protein source of the dog food you want to purchase. To help you fine-tune your protein content evaluation, focus more on the first 5 ingredients of the dog food product. Make sure that these are made up of very novel proteins or those ingredients that are very rarely used in dog food products. You can even call them exotic. You may still find chicken and beef and other allergenic ingredients in this list, however. This is understandable. As we already said, many pet food manufacturers simply fail to understand the mechanism of allergic reactions in dogs. Or, it is also possible that they understand but they simply cannot manufacturer exclusive-novel protein products because of practical reasons. Using novel proteins only means sourcing these kinds of rare proteins from a very limited market which can significantly hike prices. As a rule, the first ingredient listed should come from a very novel protein source. Consider getting dog chows that contain very limited ingredients. If it is made of a single animal protein and handful of fruits and vegetables, then you’re better off with this than something that has a very long list of ingredients. This is to help you zero-in a lot easier on the possible food allergen in the event that your dog develops hypersensitivity reactions in the long run. This is quite tricky since pet food manufacturers do not publish the actual percentages of macronutrients in their products. What you get is just the minimum protein and fat content. The problem is that, if they mean a product contains a minimum of 30% protein, does this mean the actual protein content is 35% or 40% or even 50%? Studies suggest that improving the overall nutrition of pooches can actually help in the management of food allergies. Remember the mucosal barrier and the GALT system in the gastrointestinal tract? If you can improve the overall wellbeing of these two components, then you should be able to help prevent the immune system from going berserk. Zinc, copper, selenium, and iron have all been proven to boost the functioning of the immune system. The Vitamins A, C, E, and B6 have also been shown to be highly beneficial in modulating the responses initiated by the immune system. Food allergies in dogs are a very common health problem. While some breeds have been known to be especially vulnerable to the development of food allergies, this doesn’t mean that other canine breeds are already excused from it. Since protein is the principal culprit in these hypersensitivity reactions and that all dog foods have some form of protein in it, then every single dog is at risk for the formation of allergies; although, some are luckier than most. The good news is that you can always help your pooch with food allergies by eliminating the allergenic trigger one by one or by simply adhering to a hypoallergenic formulation of dog food. 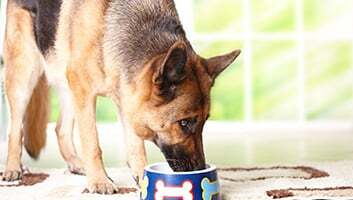 Choosing the right kind of food for your pooch is thus, crucial. Hopefully, our list of the best dog food for allergies can help you find the best one for your canine friend.